Food, toiletries and cleaning products we need & where to take your donations. Your donations of food and other essentials are vital to our work. Over 90% of the food we distribute is donated by people living in or close to our area. Without your help we would struggle to give everyone referred to us a balanced and nutritious three day supply of food. We always welcome donations and promise to use them to provide help to people in crisis. Occasionally we send food to other nearby foodbanks to support their work, particularly if they experience shortages. This ensures your donations go to help people wherever in the UK they are. See our website shopping list for food and other essentials that our foodbank needs right now. Items with stars are the items most urgently needed; the star means our shelves are bare or nearly empty of those items. 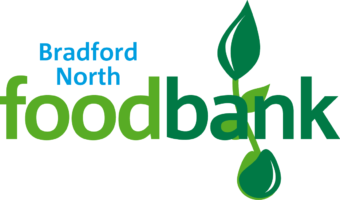 We are also registered with the Foodbank App, which can be downloaded from Apple and Android app stores (select Bradford North as your foodbank). Donations can be delivered directly to our warehouse, without prior arrangement, on Mondays or Fridays 9.30 am – 12.30pm. For delivery at other times or to arrange the collection of large donations (e.g. those resulting from a food drive), just contact our office to arrange a mutually convenient time. We book these with local large supermarkets, usually Asda in Shipley or Tesco Extra in Great Horton. They usually occur on a Saturday. Foodbank volunteers will be at the supermarket with a shopping list of items that we need and a trolley for customers to donate items that they purchase for us. Dates will be advertised here.